While the cutting edge revolving door at Natuurcafé La Port in Beerschoten, Netherlands (about 30 miles southeast of Amsterdam) may be one of the best examples of repurposing the kinetic energy that humans generate through their movement into electricity to power their stuff—the door connects the cafe to an adjoining train station and generates some 4600 kWh of electricity annually—it’s far from the only one. The Soccket is a soccer ball that was designed by Harvard undergraduates for a class project—and since incorporated as the company Uncharted Play—that harvests energy when it is kicked around and can then be used to power an included energy efficient 3-LED lamp that runs for up to three hours after just 20 minutes or so of soccer. “The more the ball rolls, the more power that’s generated,” reports Uncharted Play, which got the idea for the ball as a way to help eliminate the use of kerosene. The company also makes the Pulse, a portable, emergency battery charging jump rope designed to promote physical activity and spread awareness about the global energy problem. While the Pulse is a jump rope just like any other, it is also a portable battery charger that can be powered up from a power outlet or even better from using it. For every Soccket or Pulse purchased ($99/each), Uncharted Play donates one to a kid in a developing country who might not otherwise have access to electricity to provide a light to read at night. But while kinetic energy shows lots of potential for helping transition away from fossil fuels, it may never become more than a novelty if we continue to focus our energy resources on other proven clean renewables like solar arrays and wind farms. 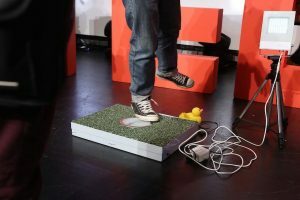 Regardless, get used to seeing more and more kinetic energy harvesting from flooring, sidewalks, soccer balls, jump ropes and who knows what else. Going through a revolving door never felt so good.